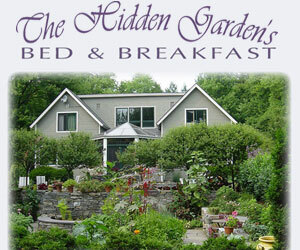 Located above a small wooded glen, The Hidden Garden’s Bed & Breakfast is a great getaway for adults visiting Vermont’s Champlain Valley and Green Mountains. This contemporary large-timbered Post and Beam home with vaulted ceilings is surrounded by 26 acres of woods and gardens. The property borders on over 120 acres of protected natural habitat and Vermont Fish and Wildlife land. These conserved lands have hiking trails that are connected to gravel and paved roads for walking, jogging, bird watching and other quiet outdoor activities. Take a brisk country walk on the Five Mile Loop or branch off on interconnecting back roads. Several golf courses are nearby as well as streams for fishing and rivers for canoeing including sections of Lewis Creek. A quiet escape not far from Burlington or Middlebury. A quiet relaxing Vermont Bed and Breakfast Inn. A highly recommended historic Vermont Inn. Ask us about Hinesburg VT area lodging. If you would like to feature your Lake Champlain Vermont Country Inn, Lodge or Bed Breakfast Inn to this web site, please contact us.